If you are seeking the fastest, most effective way to get a brighter, beautiful smile, it’s time to consider professional teeth whitening. You can choose to get your teeth whitened at the Philadelphia Dentistry office of Dr. Ken Cirka and Dr. Jessica Meier, or you can whiten your teeth on your own time at home with customized tray bleaching. The result of this popular and affordable cosmetic dentistry procedure – made possible by your Philadelphia dentists – will be a stunning, new smile that transforms your face and makes you look and feel happier. Teeth cleaning: The best surface for a teeth-whitening treatment is a clean surface. A dental hygienist will thoroughly remove plaque and tartar so your teeth are prepared for the best possible smile makeover results. Oral exam: Your dentist needs to ensure that your teeth and gums are healthy before proceeding with any cosmetic dentistry treatments. This exam is done to confirm that there is no gum disease, tooth decay, cracked teeth, or other oral health problems. Restorative procedures: If any gum recession, tooth decay, or other problems are found, they will need to be treated before teeth whitening is done. These steps may make you impatient, but it’s important for the best teeth-whitening results and the health of your teeth to tend to any problem areas first. Careful prep: When the time comes to do the ZOOM! teeth whitening, your lips and gums will be covered carefully so that the bleaching agents do not cause irritation or sensitivity. The ZOOM! in-office tooth whitening treatment: The whitening treatment begins with a whitening agent being applied to the front surfaces of your teeth. A laser light is carefully positioned and programmed to do activate the bleaching agents. A complete ZOOM! whitening treatment usually consists of four 15-minute whitening sessions. Your teeth will be an average of 10 shades whiter. And this one-time whitening treatment will last up to 10 years. Fast and effective, ZOOM! whitening is the lunch-break teeth whitening treatment that is worth the investment. Customized tray bleaching is one of the best teeth-whitening methods for patients who have experienced tooth sensitivity in the past. With the tray bleaching option, you are given take-home custom trays and bleaching gel – and complete instructions for how to carry out the whitening on your own time. You are in control of your whitening process, so the results will depend on your dedication and willingness to follow directions. Done correctly, your teeth can be about six shades whiter than they were. 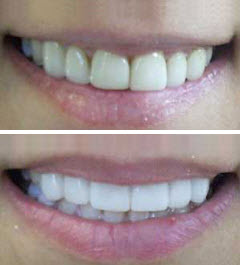 The whitening only needs to be done 10 minutes a day for seven to 10 days, and the results will last up to two years. The customized bleaching trays are far more powerful than any over-the-counter whitening treatments you can purchase at your local drugstore. Only the bleaching trays from your Philadelphia dentist have the powerful whitening agents of carbamide peroxide and hydrogen peroxide that will give you the brighter teeth you want. Professional teeth whitening is designed to separate stain molecules within your enamel and give you a long-lasting white smile. Does Professional Teeth Whitening Work for Everyone? If your teeth have been stained by smoking, drinking coffee, poor oral hygiene, medication, or have yellowed with age, professional teeth whitening treatments can usually brighten your teeth quickly and effectively. There are some conditions, however, in which teeth whitening is not the best cosmetic dentistry option. Not everyone is a candidate for teeth whitening. Some people have teeth that are naturally dull in color and have nothing to do with stains or aging. In this case, the best solutions for whiter teeth are porcelain veneers or Lumineers. If you are born with thin tooth enamel that is not especially strong, your teeth may have a yellow tint. This type of enamel also makes you more likely to develop tooth stains, even if you brush and floss every day and see your Philadelphia dentist every six months. If you have intrinsic tooth stains which are within the tooth enamel, they will require a different cosmetic dentistry treatment because whitening will not affect the stains. Extrinsic tooth stains, however, are on the surface of your teeth and usually respond to powerful teeth-whitening. You don’t need to have perfect teeth to qualify for teeth whitening. Even teeth that are crooked or imperfect will look markedly better with a whitening treatment. Knowing that your teeth are whiter will improve your confidence, which in turn can improve your professional, social, and personal relationships. One hour in the dental office of Dr. Cirka, Dr. Meier, Dr. Jeon & Dr. Smith and your life can change dramatically, all thanks to one professional teeth-whitening treatment. Contact our Philadelphia dental office in Center City to find out which method of tooth whitening or cosmetic dentistry is right for you.